Rear trunk panel hydro dipped , Cai induction Cold air intake, Strut Tower Brace hydro dipped . Steering wheel bezel, speedo bezel, Defroster vents, Speaker Bezels .And the Green zombie hands, Apocalypse editons badges . Hydro dipped Engine cover ,hydro dipped Strut Tower brace , Airbrushed ACS Hood Liner . Sorry the high gloss finish is so reflectI've . On the hood liner . Mod Kick off Day 2#.. Installed the complete new Center Console, with New 4 pack gauges, shifter bezel & new custom painted Shifter , along with side panels and Side seat panels. Mod kick off, day 3#, Finally had a pretty good day to get the new wheels swapped out. Put the new wheels on, new Caliper covers, custom painted work done by Lupe at River City Creations . I was pretty sacred when seeing the wheels all done ,it's alot of green , but the more I look at them , the more I just think they are killer. My little girl came home from school and said dad they are so cool looking , that made my day. Just got my new Cover King Seat covers in, Nice to see the nice bright Green again. Off to get my headrest embroidered with a new BIO-HAZARD symbol . Mod kick off day 4#, Spent 6 hours today working on the car. Installed 8 strips of 20 inch led lights in the engine bay. Installed new Radiator shroud , fuse box cover , side fender panels . Almost done, one more major project left. Install the grill lights & under body lights . Then all thats left is little details . Waiting for next nice warm sunshine day. 1st car show is April 26th . Hope to be done . .
Mod kick off day 5#. Finished up the engine bay lights today. Put in controler box & power harness . Powered up the lights, I'm very happy with the results. I took some pics & video . But can't figure out how to post video. Also put the new Painted radio bezel on. And found some door edge guard that I use to go around the ACS hoodliner . Makes it clean looking . Also used this around the bottom of my ACS T 5 splitter . And will be adding it on the rocker panels. , another good day of mods down. Waiting for the temps to rise and the fog to lift . Mod kick off day 5# or 6# LOL . Going to install new cover king seat covers 1st thing . And we'll see where the day takes us . Still need to pull the front end nose off to install the grill lights . Got some other minor detail stuff to do also ..
Mod kick off day 6#... it finally warmed up & the sun came out to play for a while . Started around 11am finished up at 4pm.. I got the old seat covers off & all brand new cover king covers on. Nice to see the bright green again . Cleaned the whole inside of the car, put seat belt pads on. Then put the edge trim on the ACS Rocker panels. Also put edge trim around the radiator shroud . Nice clean look. Then put on my billet custom covers for the power seat buttons. Then billet custom AC cap cover. Next put the bolt cap covers from upr over the fender panel bolts. Next was the billet custom caps over the retainer caps on the trunk drain lids. Put my new slime green hands on my rear windows . Added apocalypse edition emblems to the CAI box cover & the bottom of the Speedometer bezel .Also added new custom trunk release painted black with black Bio-Hazard symbol . Over all a great day. I finally got my sample of powder coated bolts from route66mods. tried them out on the wheels and look super sharp. Changing the chrome to black looks so much better and they pop . He's making me 100 of them now . can't wait to get them on the wheels so they will be complete. Also got my center piece for the engine cover , Black Bio-Hazard symbol with black nickel . looks amazing , I'll post pics later . Car is almost done , still have that grill lighting and under body lighting to do . next week is looking warmer . 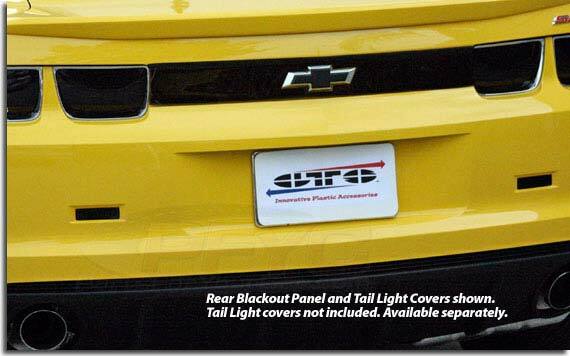 Just ordered the GTS rear Black Out panel , got free shipping with my rewards points . I think this will complete my black out look. Going to paint the Chrome part of the Bow Tie Synergy Green . And the center is Billet Black . .. I just have to find blackouts for the reverse light now. Any body know where to find these? Well got the GTS Black out panel , opened it up , and 1st thing I see is the Bow Tie cut out is not level at the top . So I go try it any ways , Totally off , and not centered . Also a lot of scratches on the plastic . Very bummed . So I get hold of PFYC , and sent some pics. And another new one is on the way . Be here tomorrow . I will try that one and see how it goes . I like the look of it , but the cutout is a little big. Plus it had double back tape on it . I don't like that idea . I'll have to take that off and change to velcro tape . so it can be removed and cleaned . But good news is , after installing my new front seat covers . I noticed the back seat covers were faded a little bit also . So i decided to get new ones. Talked to the guy I bought mine from and instead of paying full price for a set . I got the deal if you buy the complete set front & back . So they are on order . Should get the e-brake handle from UPR tomorrow , that was on back order. Also ordered 200 # BIO-HAZARD stickers , black circle with green symbol on them , to give out to the kids at car shows .. Okay , got a new replacement Gts rear black out panel today, 1st one was cut uneven . & scratched. 2nd one still cut worse than the 1st one. The Bow Tie area is cut to big, so you see the color of the car around it . Suppose to be a black out panel . . Very dissappointed. Also scratched . So returning for full refund . A big thanks to pfyc.com. great customer service . I think I'll go a different route . Just going to totally black out the Bow Tie only. Got to do a few things today , got the new head rest on. Added the center piece to the new engine cover . Put the new upr e-brake handle on, and the new Painted cover for the lights controler box on. Things left to do , tomorrow I take of chrome camaro fender letters & replace with new black letters. Clean the trunk area . & interior Then wheels . Tires will get a shine. Tues looks good to pull off the front end & install the grill lights . The all that's left is the Underbody lights. Waiting on new back seat covers from cover king. And ac vent trim , paint them synergy green . Got the chrome fender camaro lettering off today , and put the new black camaro lettering on. Turned out amazing . Looks really sharp . .
Front nose off and installed the grill lights, Took 3 hours , start to finish , Lights went in easy , I won't be taking off the nose again that's for sure , not a bad job , but that top 20mm bolt is a pain .lol getting my front shroud in now , then all that's left is the under body lights ..
Well its official , car is really all done. Just have to put the under body tubes on and wire it up. And of course install my new cover king back seat covers when they get here. After taking of the front fascia I learned it's not a hard job , just a pain to get your hand up in there to get to the 20 mm bolts. . I mounted one 24 inch tube on top of the crash bar & the other tube on the bottom. Put 3M tape on the ends to keep in place and ran double wire ties on each end . It just seemed easier to do it that way . Snaked the wires in by the horn up through the CAI . You can see the bottom tube through the bottom grill , but I think it will work ok. After that put the upper support shroud in. And put the new Hydro dipped top shroud on. That was a pain, had to modify a bit , but got it all done & looks great. After that cleaned and waxed the car and wheels . Finally the end. Tomorrow will be another day.. Car show this Sunday the 19th. Oh my black wheel bolts will be here tomorrow . Mod kick off 7,8, 9 . I Fogel . Lol. I Finally got my black powder coated bolts today from Stan at Route66mods. 1st all I can is a great guy to work with, went above & beyond for me..And his work is impeccable . .
Got them all on the wheels And they look amazing . A night & day difference from the chrome bolts. Detailed the interior , clenched & shined all the plastic. Wax the painted center console . Cleaned the windows . Then cleaned the trunk . Started to load up the car show stuff, chairs, floor mats , Show boards cleaning bin, zombie body parts & Earl my Zombie driver... All ready to go.. .... Here's a few pics of the stuff all done. Today I did some small detail stuff. my son got me a black paint pen . I was skeptical at 1st , but this worked really great for what I wanted to do . Of course I tried it out 1st. .
so what I wanted to do is paint the chrome rivets on my box covers and on my Cai box .So I did it and worked great. Then I had this idea of that chrome camaro lettering on the steering wheel . So I black it out . It looks really cool. Now I just have to get rid of the chrome ring around the steering wheel , center actually the air bag .. Ordered new Strut Tower Covers today from Lupe, Gloss black with a Synergy Green Bio-Hazard symbol in the center ,custom painted . I got tired of waiting on Pirate Manufacturing, Making any new solid black ones. Plus those silver rivets stick out like a sore thumb on the ones I have. I also got my Bio-Hazard stickers in the mail today , these are for the kids at the car shows . I also give them pics of the car with zombies in the background .